Celestine loves to join in on the dressing up for our events. She has her special little skeleton sleep-suit. It was sent to her by one little girl who loves Isadora Moon and knew I had recently had a baby. Of course, I wore my flower crown today. Today was a big flower crown day. I’m currently trying to put together an even more sparkly magical costume, but I’m not quite there yet. As usual, the children produced a variety of high quality artworks. Most of them tend to go for the plain picture of Isadora Moon where you can add her outfit, and they always do this differently. There was one little girl who was just two years old. She loved colouring in the stars on the tent picture. (She was also very interested in the stuffed pink rabbit I brought along!) Another girl told me she was an artist. She loved drawing anything and everything, and also would go through the recycling to find art materials for models. I love the glittery stars and hearts they provided at St Albans Waterstones – I meant to ask where they were from! I always start with a little bit of a talk about Isadora at my Isadora Moon events before the reading. If most of the children already know about Isadora, then I usually let them decide which book they would like the reading from. Today they wanted Isadora Moon has a Birthday, so I read the opening pages where Isadora talks about the differences between fairy, vampire, and human parties. Everyone can usually guess which parent decorated each side of Isadora’s house! These girls all wanted to pose with their new copies of Isadora Moon they had bought. We were at St Albans for about an hour and a half. I’m always touched when people turn out specially for the Isadora Moon events, but I also love those chance encounters with people who discover Isadora for the first time when I’m there. As we were starting to wrap up, there was a girl browsing with her mother. Her name was Estelle – a name I love because it means ‘star’, as in ‘stellar’. 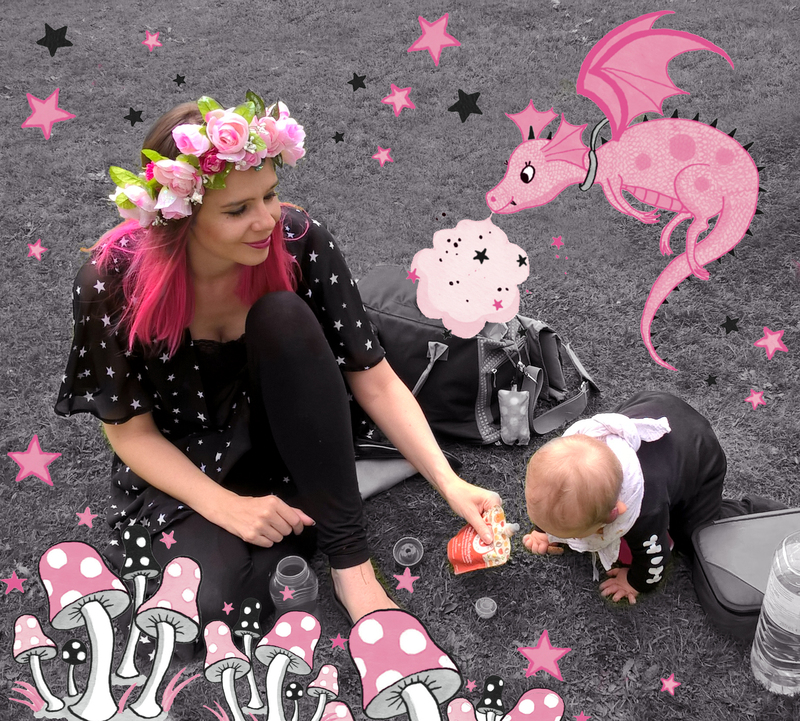 We invited her over to do some colouring and started telling her a little about Isadora Moon. Both her and her mother were really enthusiastic and complimentary about the books. They asked me lots of questions about Isadora, and went away with signed copies of Isadora Moon Goes to School and Isadora Moon Goes to the Ballet. Just as we were packing up, another family came in with their little boy and little girl. Even though their little girl was only eleven months, the parents were very interested in Isadora Moon. We got chatting about our children and they were very friendly. They offered Celestine a stick of cucumber and slice of apple, since they were giving them to their two. They bought a couple of books in the end, so hopefully their little ones will enjoy reading about Isadora’s adventures when they’re old enough! Celestine managed to get food all over her costume, so had to switch to her starry dress. We sometimes use ‘Babease’ food pouches as a less-messy alternative to finger food if we’re on the go. However, that didn’t quite work out as Celestine decided to grab it and spurt it all over her outfit. We cleaned up, changed Celestine into her starry outfit and headed into Harpenden Books. I already have (and love) all of the Moomintroll books but DO WANT. The first girl to arrive actually came to my previous event at Harpenden Books, and was back to get her new copy of the just-released Isadora Moon Goes on a School Trip. She’s the one colouring at the table. The girl looking at the books in the corner with her mother was meeting Isadora Moon for the first time. They bought a copy of Isadora Moon Goes to School, the first book, to try. Hopefully she enjoys it! Brownie with whippy ice cream and salted caramel sauce – yum! Celestine loves being in busy places and staring at the people – as well as my pink hair. It’s been a great few weekends meeting different people at the Hertfordshire Waterstones shops. Thanks to the staff at all the stores for facilitating such brilliant events. It’s got me feeling ready for the very busy autumn I’ve got coming up. If you haven’t already, you can read about my Isadora Moon events at Welwyn and Hatfield last week and my Watford event two weeks ago.